The challenge on the Butterfly blog this time is the word KEY and/or the colour VERMILION. I'd been working on some background pieces using Distress Oxide inks and it so happens I'd been going for greens/blues so this time I've only managed to comply with the KEY part of the challenge. The background was done with the Oxides before applying some normal Distress ink and a little white acrylic paint using stencils. Some text was over-stamped in black onto the background as well as the sentiment; the two layer butterfly was die cut using a left over piece of the background card for the back layer and a key was die cut from black card. O love the beautiful background that you've created here Val, and I love the overall card too. Hello Val, sorry it's been so long since I left a comment. I have dropped by a few times but seem to run out of time for commenting much these days which is very naughty of me. I think it's very apt that I decided to have a saunter round today because butterflies are my absolute favourite and your card showcases the lovely TH butterfly die beautifully. I adore your background and colours and I recognised the sentiment immediately as I have it somewhere in my stash, lol! I'll try not to leave it so long next time. Thankyou for being the first to enter this challenge. I love the background created with the oxide inks. Love that die cut key as well and looks perfect in black on the card. hugs Mrs A. 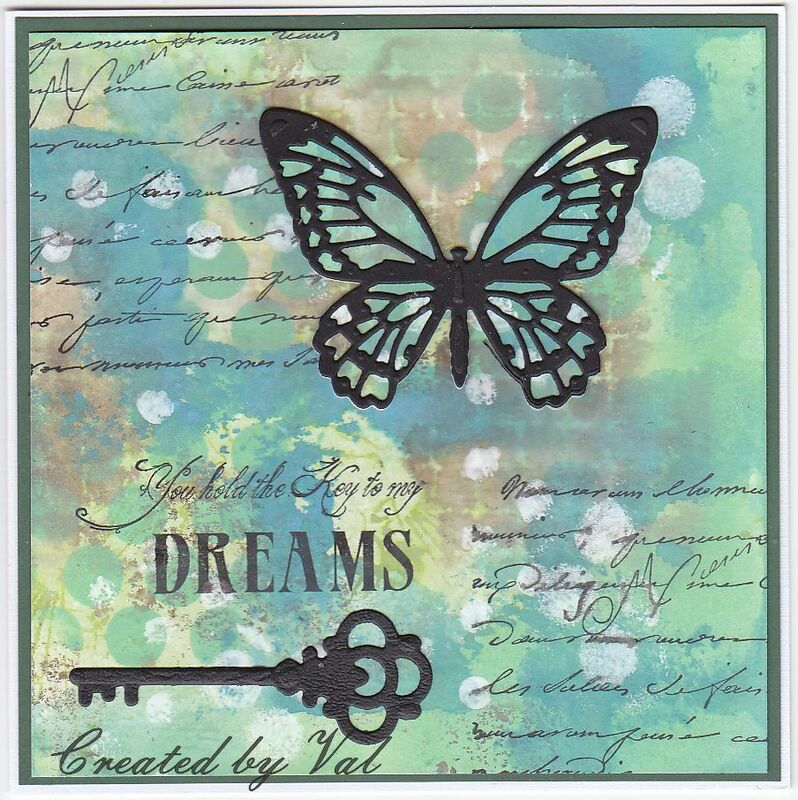 Beautiful background, with gorgeous colours Val, love your butterfly and sentiment. Amazing background, I love the colours and your desing. 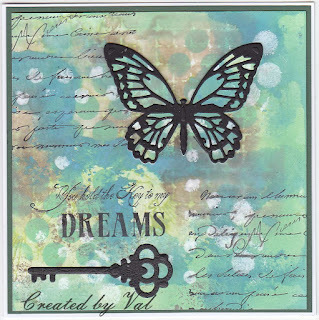 beautiful card Val...I am loving the look of the Oxides.